I knew I had stumbled upon an incredible brownie when all my friends gave me feedback like this. Funny thing was that I felt the exact same way. It started when Ellen, a friend from high school, posted a recipe on her facebook page for Peanut Butter Cookie Dough Brownies with a tease for me to try them out. It really only took one look at the picture and I knew what I was going to be baking next. After sending goodie bags around to friends and getting their feedback, of which I only quoted the printable responses, I did a bit of digging. The original recipe was posted on Food Network, but it was RECIPEgirlwhose post made it to my friend’s facebook page. I decided that I wanted to incorporate the best of both recipes to achieve brownie nirvana. They may be a tad on the decadent side, but they are soooo worth it. If you are anything like I am, these brownies will undoubtably turn into a keeper recipe for you. May the decision of which peanut to use be your most challenging decision of the day. Preheat oven to 350º. Line an 8” x 8” baking pan with a sheet of parchment paper. Set aside. Melt the butter and unsweetened chocolate together. Set aside. In a mixing bowl, beat together the sugar and eggs until combined. While the mixer is on, add the chocolate mixture. Add the flour mixture. Blend in the vanilla. Lastly, fold in the chocolate chips. Pour into the prepared pan and bake for 28 minutes. Remove and cool completely on a wire rack. Using an electric mixer, beat the butter, peanut butter and brown sugar until creamy, scraping the bowl down as needed. Add the milk. Blend in the flour and salt until combined. Evenly spread the cookie dough layer over the top of the brownie layer, taking it to the sides. Top with the chopped peanuts, gently pushing them into the cookie dough. Refrigerate while making the topping. In a small bowl, combine the chocolate, whipping cream and sugar. Microwave for 30 seconds. Stir. Microwave 30 more seconds. If the mixture is not melted, continue to microwave in 20 second intervals until it is completely melted. Pour the chocolate topping over the peanuts, taking it to the edges. Sprinkle the peanut butter chips over the chocolate topping, gently pushing them into the chocolate. Refrigerate until firm, at least one hour. Gently lift the parchment paper out of the pan and place on a cutting board. Peel the parchment sides down. Use a thin, sharp knife and cut into 16 squares. Allow to sit at room temperature for 20 minutes before serving. Lightly salted peanuts may be substituted for honey roasted ones. It is a tough decision between the two. Keep both handy and you will always be happy with the end result. 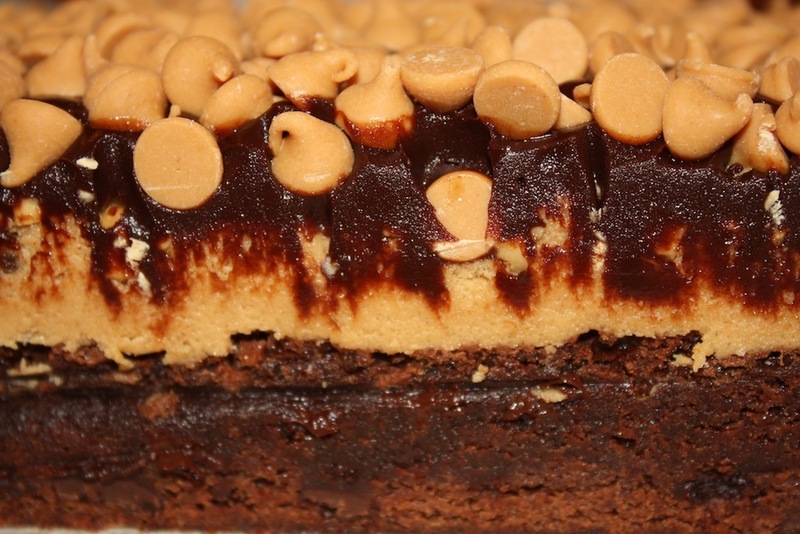 The density of the brownie may be altered for personal preferences. If you want the brownie layer to be cakier, bake a couple of minutes longer. If you prefer a mushier brownie layer, bake a couple of minutes less. I was secretly hoping you would post this recipe. I was one of the lucky recipients of a trial brownie – which had to be shared with my 5 kid carpool. Needless to say – we were all begging for more! These are one of the yummiest treats I have tasted. My skinny jeans keep moving further back in my closet. Thank you for the laugh I just had reading your comment, Morli. It is great. I think you need many more batches of these yummy treats before your skinny jeans have to be put away! Thanks Barb! Have a great time making them and you are welcome to samples anytime. These are dangerously good — as in hide them away from my husband and children good! Peanut butter and chocolate is my favorite flavor combination, and this is one of the best ways I’ve ever had that combination. I suppose I will have to make them myself one of these days, and when I do the gorgeous photos on the blog will be a tremendous help in guiding me! Thank you so much Julie S! I appreciate your feedback about the pictures. These are AMAZING!! I just made these for the second time. This time, I cheated and used boxed brownies and they were still great. Thanks for the great recipes! I just shared this one on my Facebook. I am so glad you improvised to make the recipe work for you. Thank you for letting me know and for sharing it on Facebook!